End of July, I booked a last-minute trip to Bangkok using 135,000 Lufthansa Miles & More miles + €544,41 in taxes and fees. Not my best redemption to date, but due the last-minute nature of my trip, a better option than paying >€2000 for a revenue ticket. My trip started with a Lufthansa Business Class flight from Brussels to Frankfurt on which a delicious muesli breakfast was served. In Frankfurt, I visited Lufthansa’s flagship Senator lounge with features the ‘City Lights’ bar and a modern wellness area with luxury facilities that include ten showers and two spa rooms. 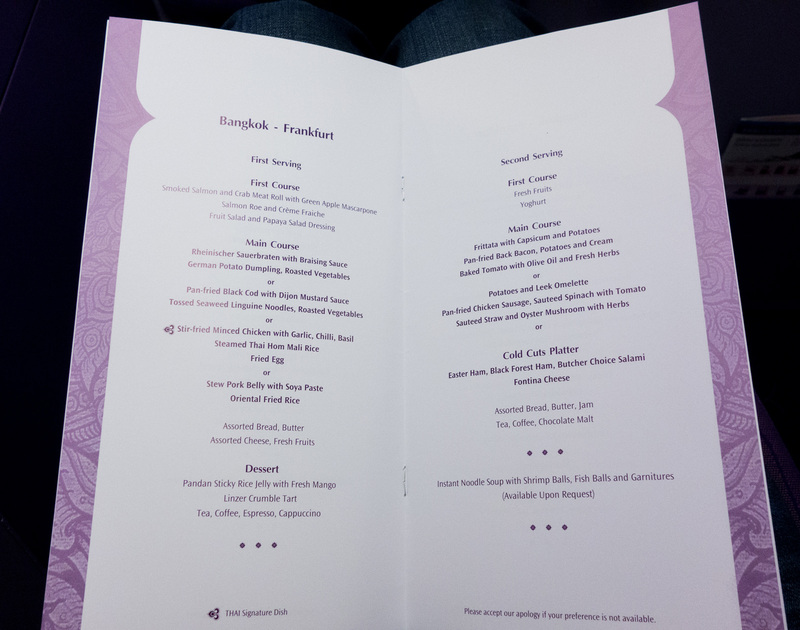 As I had already flown Thai Airways A380 First Class twice (TG920 BKK-FRA and TG676 BKK-NRT) and as there was no award availability for Royal First this time, I used the opportunity to try the Thai Airways A380 Business Class cabin. At the time of booking, only middle aisle ‘honeymoon’ seats were still available. (see Upper Deck, Thai Airways A380 seatmap) Middle aisle seats form alternating pairs which are directed inwards or outwards. The inwards directed seats are so called ‘honeymoon’ seats which are great for couples, but not if you’re traveling solo. The outward directed seats are known as ‘divorce seats’. Fortunately, I had honeymoon seats 19E and 19F for myself. Once settled in my seat, I was provided with a Borghese amenity kit and had a glass of Piper Heidsieck Brut Champagne as pre-departure drink. Flight TG921 left Frankfurt at 2:45pm with foreseen arrival at 6:25am in Bangkok. After departure, chicken satay with peanut sauce was served as hot savoury and orders were taken from the Thai Royal Silk Taste menu. I paired my main dish with a matured red wine from the Thai Royal Silk Wine & Beverages list. Overall, the food experience was underwhelming. After flying Turkish Airlines Business Class several times and enjoying its delicious DO&CO catering, one’s expectations of inflight meal get much higher! After dinner, it was time to enjoy my fully lie-flat seats. Unfortunately, I didn’t catch much sleep as my biological clock was still convinced it was only early evening time. I noticed how a passenger was anxiously watching his inflight entertainment screen in flightpath mode all night. At departure, he had demanded a statement from the Captain ensuring we would not enter Eastern Ukraine airspace or other war zones. Just 48 hours prior to my flight to Bangkok, MH17 was shot from the skies above Ukraine. Passengers flying Thai Airways Royal First or Royal Silk class can enjoy a complimentary Spa treatment at the Thai Royal Orchid Spa at Bangkok Suvarnabhumi airport. As Royal Silk Business Class passengers are only entitled to a 30 minutes Neck & Shoulder or Foot Massage, I skipped the treatment. 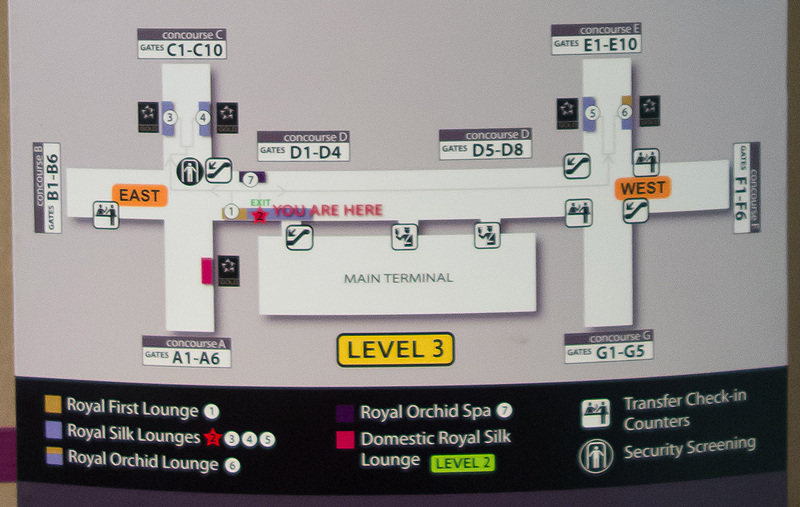 Here’s a map of the locations of the different Thai Airways lounges and Spa. 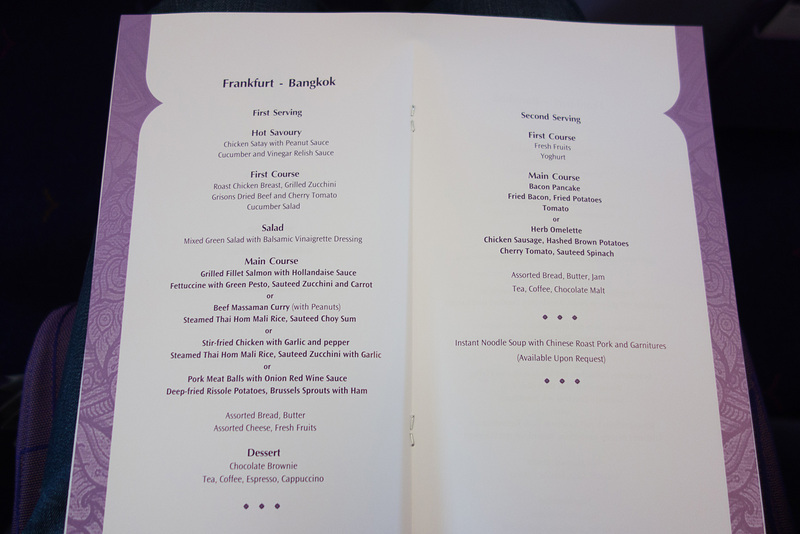 However, I did have a late night dinner on the Thai A380. 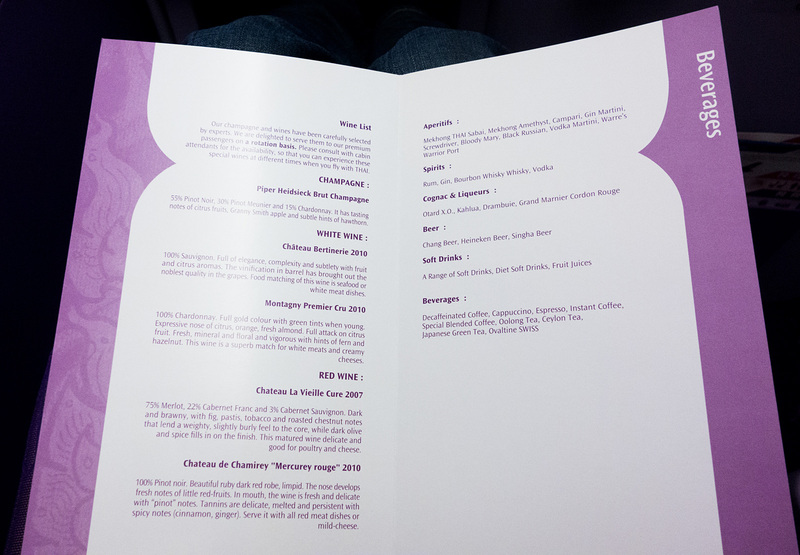 Here’s the taste menu of my Bangkok-Frankfurt flight. As I had skipped breakfast on the BKK-FRA flight, the cold cut platter was a great welcome on my Lufthansa Business Class from Frankfurt to Brussels. ← IHG Rewards Club: Earn 2 free nights or more! Thank you Annie! Love your blog. Perfect timing…Flying BKK-CDG on the A380 and have had a hard time finding recent reports on the A380. I’m a bigger guy than you, so was curious if the A window seat (which I have) is a bit tight to exit? I just had the massage during my connection from Sydney to Frankfurt. It was very nice, as might be expected in Thailand. I could see how originating in BKK it might not be as interesting, but for a connection between two long flights I recommend it. Thanks for sharing your experience Brian! hi! Thank you for sharing yoyr experience. I’m flying Thai Royal Silk in December (BKK-CDG). Which seat would you recommend? I was booked on seat 12k but after checking the seatmap online, i’m afraid it might be too close to the bathroom…what do you think? And also, do we get the complimentary massage in the business lounge? Hi Lucas, 12K should be ok, A or K seats in row 15, 17, 19, 21 or 23 should be good alternatives as well. Royal Silk Business Class passengers are only entitled to a 30 minutes Neck & Shoulder or Foot Massage in the Royal Orchid Spa. Enjoy your trip!